Growth in corporate wages remained stable in January at 7.3%YoY but was above market expectations (6.9%YoY). We think this is a strong figure given the negative impact of administrative decisions and statistical effects. A lower increase in the minimum wage compared to the previous year subtracted 0.5pp from the headline rate. Also, companies which employ more than nine people are now required to report their statistics and smaller companies tend to pay lower salaries compared to their larger peers. Those two negative effects were offset by possibly stronger wage hikes elsewhere. Effects of lower minimum wage hike (approximately -0.5pp) were offset by growing pressures on companies to raise salaries. 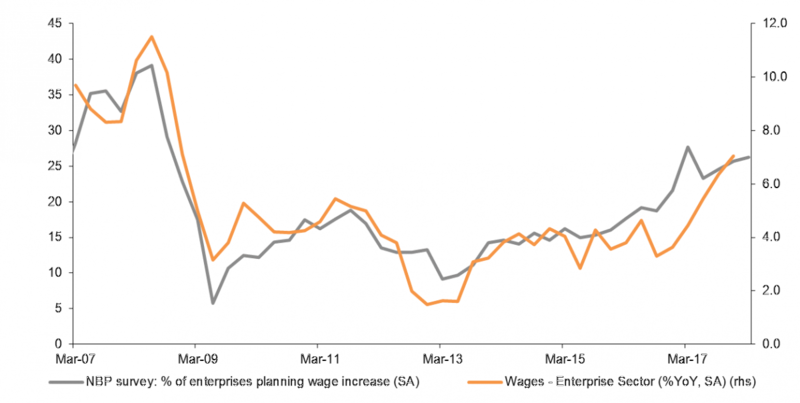 We find this report an important signal for stronger wage gains in coming months - especially important should be the March-April period when bigger companies usually deliver hikes. 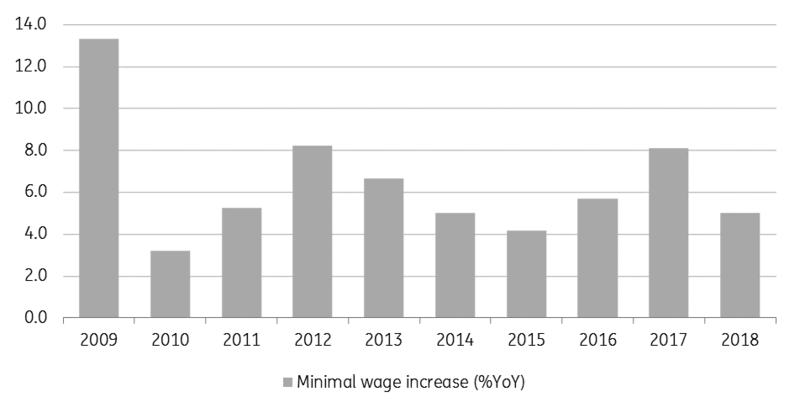 So far, the National Bank of Poland's survey has shown a rather slow acceleration of wage pressures (see chart below), yet upward surprises are likely. Companies are not reporting problems with labour costs, and there are signs of optimism in nearly all sectors except retail trade. Thus wage growth should continue. 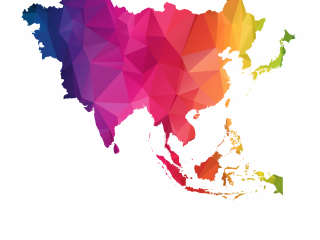 Stronger wage hikes are likely to come from the construction sector as the investment cycle advances and demand for labour rises further. Overall we expect double-digit growth in 4Q18 (10.2%YoY wage growth). 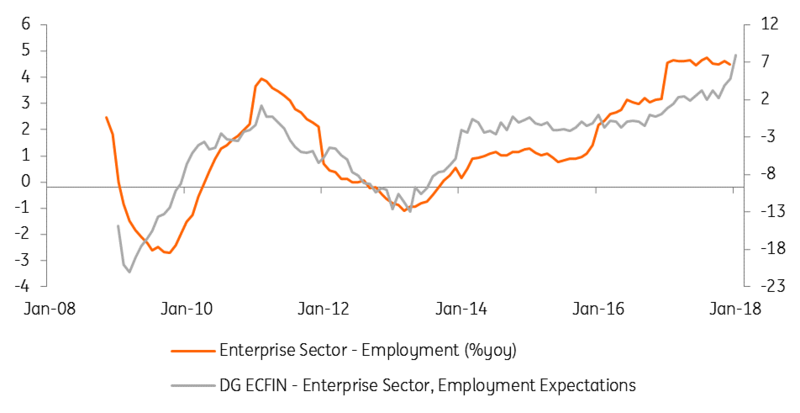 Enterprise employment decelerated from 4.6%YoY to 3.8%YoY – better than the market consensus (3.4%YoY). The January data nearly always creates shifts related to panel rebalancing, but this figure still seems strong given the lowering of the retirement age. The positive trend should continue - official GUS/ European commission employment expectation indicators are at the highest level since 2008. So far, the recent wage acceleration (in Poland, it's still below other Central and Eastern European countries) is offset by a strong rise in productivity, hence we still believe the central bank can provide calming rhetoric during the March meeting and brush off recent expectations for a rate hike. However, we think the January wage figure points to further upside in February and March, which may challenge current MPC rhetoric. We think a strong Polish zloty/weak dollar will help to contain prices and believe inflation will be an issue in 2019 (INGF CPI at 2.9%YoY average) rather than in 2018 (INGF CPI at about 2.0%YoY average). As such, we don't expect rate hikes until 1H19.